In the International Intercultural Mural Exchange (IIME) project, JAM guides the participants how to proceed the program step-by-step. 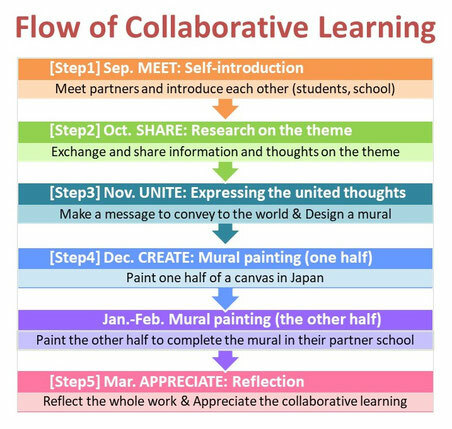 Even beginners will be able to easily carry out the high-leveled collaborative learning in their classrooms under JAM's guidance and advice. 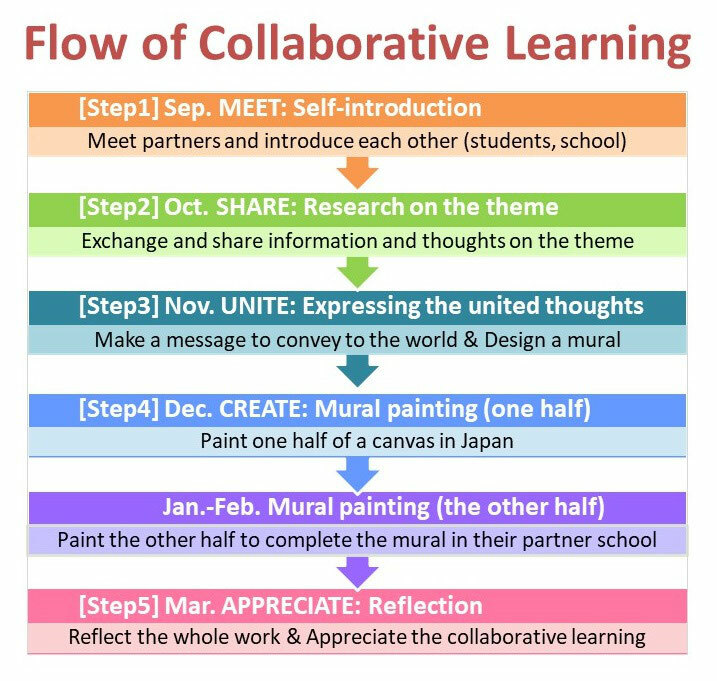 The collaborative learning in IIME proceeds according to the five steps. The participants start the project with self-introduction in September. 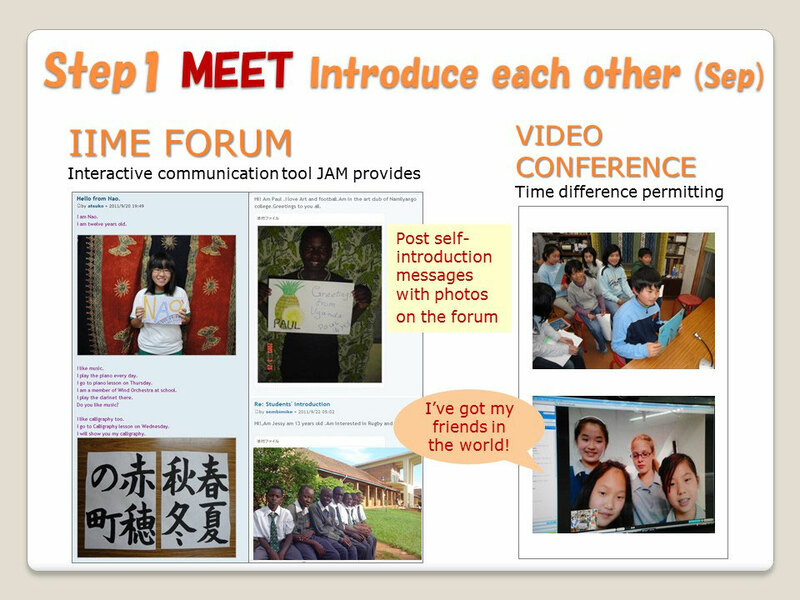 They introduce themselves, their schools and local cultures to their partners in the online forum JAM provides. We advise the participants to post as many photos as possible in the forum, because they can know about the other much better by photos with some explanation than only by words. We also recommend to do video conferences if the time difference permits. Face-to-face communication helps the students feel closer to their partners. If the time difference is too big to do a video conference, introductions by videos are also effective. October is a term of RESEARCH on the theme. Each pair can decide their own theme by discussing within the pair. The students of each side research on their theme in the library or internet or interview and so on. 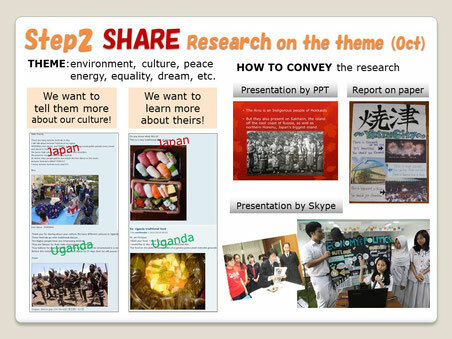 Their teachers post their research on the form to share it with each other. Description in words about unfamiliar world is difficult to understand even for adults but images with a brief explanation are easier to understand. One of the benefits of the forum is to share information and opinions easily and another is to record them by the topic by a time series. It is really convenient and useful to reflect their learning in the end. After sharing research and thoughts on their theme, they discuss on the forum how to express their idea on the theme as a picture and how to divide it into two parts and which part to draw. 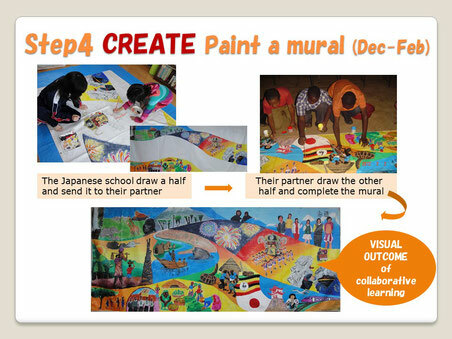 In November - December a Japanese class draws a half of the mural then send the canvas with paints to their partner. Then their partner class draws the other half to complete the mural in January-February. which suit the vinyl material. The paints are produced only in Japan so Japanese schools buy paints including their partners and send a half painted canvas with the paints to their partner. After the mural is completed in the Japanese partner class and the students appreciate the work in their school, they send the mural back to Japan in the end of February. 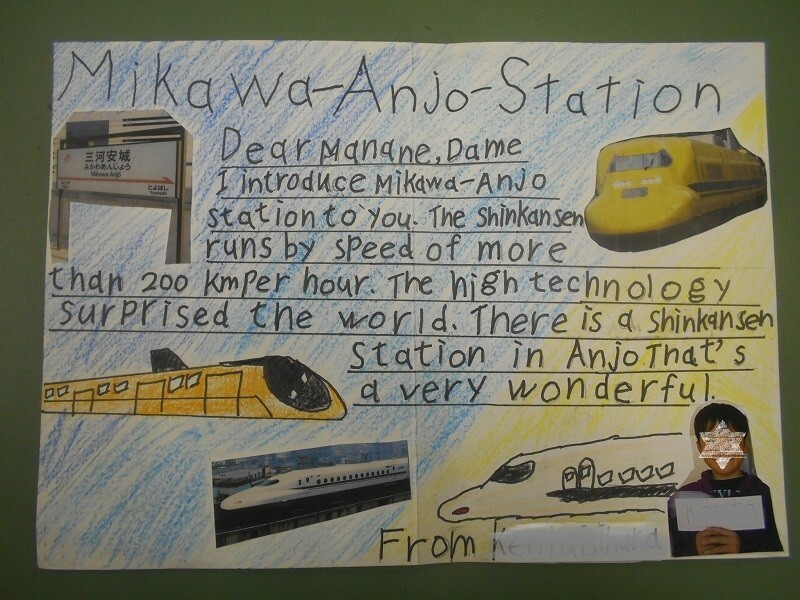 Then the Japan side appreciates the work. The both share their impressions and thoughts on the forum. The pictures on the screen show different ways to appreciate the works. 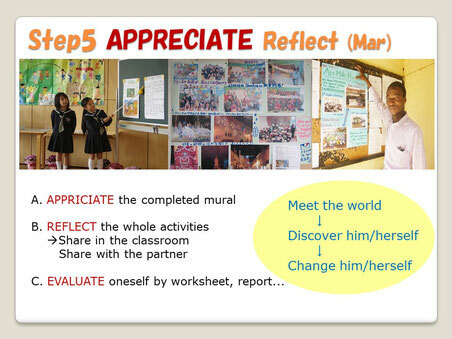 After appreciating, they reflect the whole activity and make the final report in March. 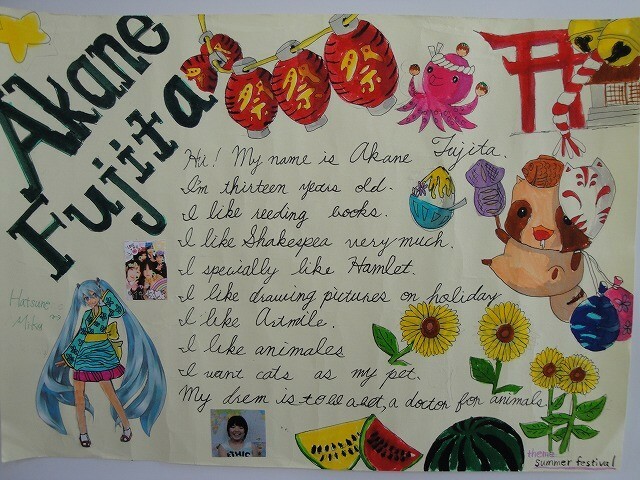 The students are introducing themselves fluently in English. 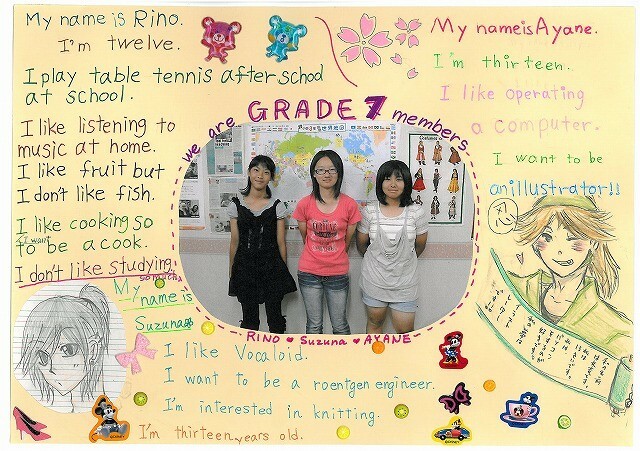 The students come from different countries. The students are showing around their school. You might feel like walking in the school with the students. 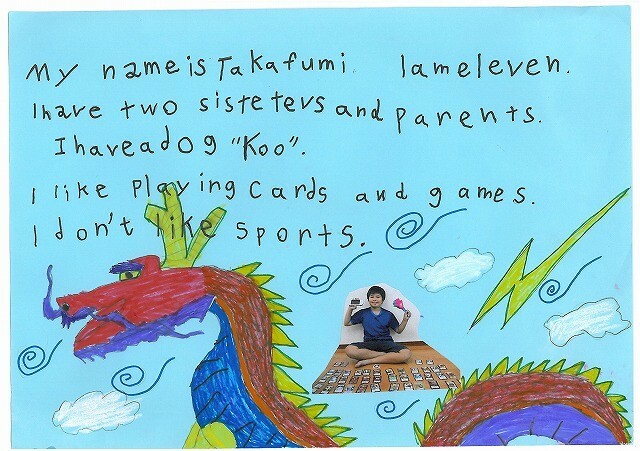 You can see their English lesson. You might feel familiar with nature and see a lot of animals in their school. 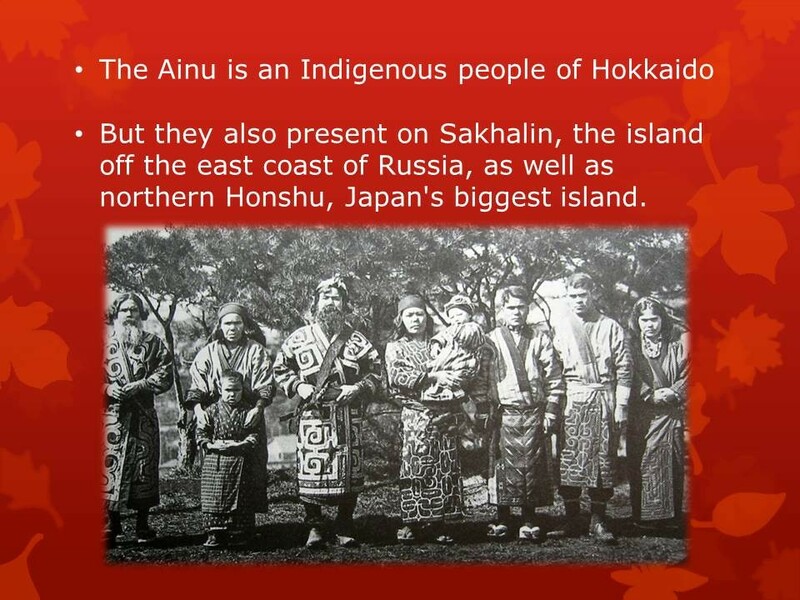 Including the country introduction. Their class names are big fun! A video made by the students. The students look so talented. 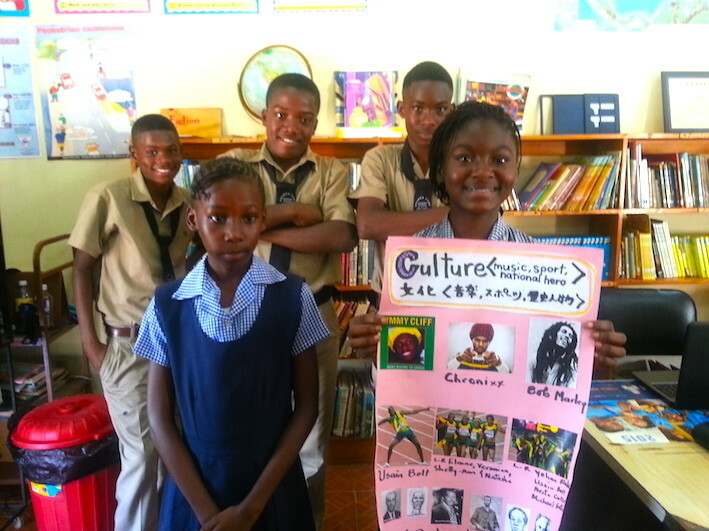 The students are introducing their country in earnest. You can enjoy the whole day of school. 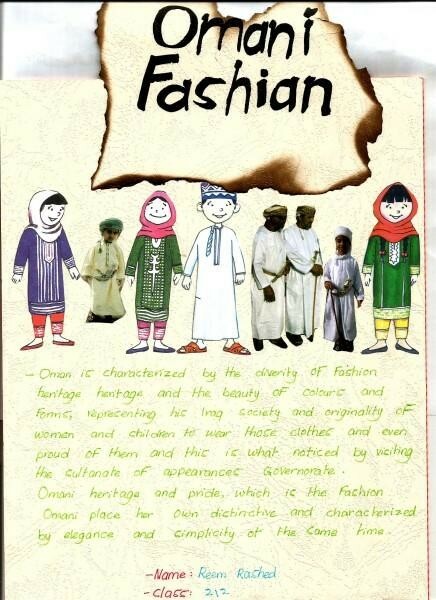 Its title: Oman is the Jewel of the Arabian Gulf.